Car lockouts happen all the time. Most people are mortified when it happens to them, what they don’t realize is that it is very common, in fact it happens almost every day, so there’s nothing to be embarrassed about. The worst part of car lockout is that it can be very inconvenient. After all, who wants to be stranded outside of their own car, especially when they are in a hurry? There are a few reasons that car lockouts happen – drivers lose their keys or their keys are stolen, or the key could even break off in the lock, in the case of an old car. With new cars sometimes the transponder is faulty – and we can help with that too. Whatever your car lockout problem is Newway Towing is able to help. The techs we cooperate with will provide you with just the type of service you hope to get and all for a price that’s hard to beat. San Rafael drivers know that they can rely on Newway Towing to help them out of these situations. Newway Towing is just a phone call away and a locksmith will be dispatched promptly to sort out your problem. We work around the clock, every day of the year and we also promise a very quick arrival time in San Rafael. Newway Towing offers extremely reasonable prices for car lockout emergencies in San Rafael. Our dispatch will give you a price quote right there over the phone – we believe in being upfront, we want you to know how much our service costs so there are no surprises later. 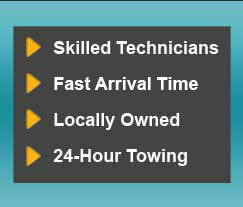 Newway Towing’s team provides a range of different roadside services, including car locksmith solutions. The members of the team all take great pride in all of their work and are highly trained and very skilled. The team has made customer satisfaction their primary goal and they will do their best to make sure that each customer is always perfectly satisfied with their work. Our experienced team members will come to all calls in a Newway Towing company van that is equipped with everything they need to carry out all car locksmith solutions on site. We want to be able to do our work quickly so that you can continue with your day, we don’t want you to waste any more time than you absolutely have to.